Dancers backstage, Ballets Russe, "Le Sacre du printemps"
Exactly one hundred years ago, a riot broke out among the Parisian sophisticates attending the premiere performance by the Ballets Russes of Le Sacre du printemps, otherwise known as "The Rite of Spring." Since then, the names of its composer, Igor Stravinsky; impresario, Sergei Diaghilev; and choreographer, Vaslav Nijinsky have become synonymous with the birth of 20th century modern culture. Historians are still arguing over the reason for that fistfight. Was it the propulsive and unsettling atonal music score? Or, the scary storyline about the death of an innocent maiden during a tribal sacrificial ceremony? Or could it be the revolutionary choreography, when instead of the expected elegant dance en pointe, Nijinsky sent his dancers onstage stomping and twisting? In 1987, we in LA had the good luck to see the first recreation of this historic production by the Joffrey Ballet on the stage of Dorothy Chandler Pavilion. 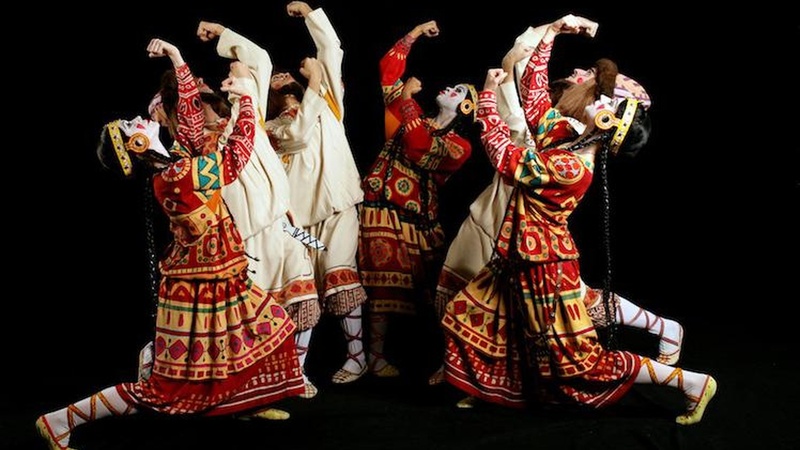 I knew the original ballet only through the history books and reproduced images of the costumes and set design by famous Russian artist Nikolai Roerich. And all of a sudden, it all came to life onstage, in real time, before my very eyes. But this time, we in the audience were enthralled and overjoyed – no riots were reported. This coming weekend, in commemoration of Le Sacre du printemps' hundredth anniversary, the Joffrey is returning to Los Angeles with its inspiring and historically accurate staging of The Rite of Spring, painstakingly researched by dance historian and choreographer Millicent Hodson. Dancer Ruth Amarante, Pina Bausch’s production, "Le Sacre du printemps"
In the ensuing years since its 1913 premiere, this ballet has been re-staged and re-imagined by great choreographers, among them the incomparable Pina Bausch (the subject of an excellent recent documentary by Wim Wenders). We had the chance to see her mind-boggling version of Le Sacre du Printemps when she brought her Wuppertal theater company to Los Angeles during the 1984 Olympic Games. The stage floor was covered with a thick layer of soil on which the semi-naked dancers leaped, stomped and screamed, taking the story’s barbaric undertones to new levels. The centennial celebration of this seminal ballet continues throughout 2013, both here and in Europe. The New York Times just ran an article about an experimental dance and theater version of The Rite at the University of North Carolina, Chapel Hill (organized by the Bill T. Jones/ Arnie Dance Company and the SITI Company). In May, the National Gallery of Art in Washington will host an incredibly ambitious exhibition dedicated to the illustrious history of the Ballets Russes, co-organized by and originating at London's Victoria and Albert Museum. Back here in LA, The Music Center has prepared some special treats to go along with the Joffrey’s performance this weekend. There is a Q&A tomorrow and a symposium this weekend, along with an ongoing exhibition free and open to the public through February 17th. You will find all this information on the Art Talk page at kcrw.org. The author of the best-selling cultural biography, Ground Beneath His Feet: Joffrey’s "Rite" in Los Angeles, and director of USC Annenberg Arts Journalism Programs, will be answering all your questions about the Joffrey Ballet and the reconstruction of Le Sacre du Printemps (The Rite of Spring). Join the conversation by following the Music Center (@musiccenterla) and Sasha (@SashaAnawalt) on Twitter and by using the hashtag #joffreychat. 2:15-3pm: Lynn Garafola on Embodied Identities: Dancing "The Rite of Spring"
3-3:30pm: John Bowlt on Kingdom of Mystery: Nicholas Roerich and the "Sacre du Printemps"
Curated by Lorin Johnson and Mark Konecny, this exhibition explores early dance innovation in Los Angeles from the 1910's to the 1930's as a synthesis of ideas from émigrés and local artists, celebrating Stravinsky’s creative influence on dance-makers in Los Angeles and including rarely seen photographs by Otto Rothschild.